LONDON – Francesco Molinari capped an unforgettable year in December by becoming the first golfer in 18 years to be named World Sport Star at the BBC Sports Personality of the Year Awards. 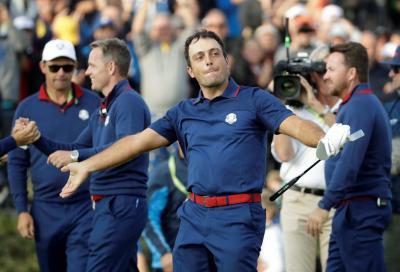 Molinari made history earlier in 2018 as he became the first Italian major winner at the 147th Open at Carnoustie, before a flawless Ryder Cup performance saw him triumph as the first ever European player to win five out of five matches. The stellar season included Molinari’s first ever PGA Tour victory and a win at the European Tour's flagship BMW PGA Championship, which all culminated in November with the Italian claiming the European Tour's season long Race to Dubai crown. At the BBC awards on Dec. 16, Molinari overcame challenges from US gymnast Simone Biles, Czech skier and snowboarder Ester Ledecka, and Ukrainian boxer Oleksandr Usyk as he became the first golfer to claim the World Sport Star award since Tiger Woods in 2000. European supporters and golfing fans in general around the world have been delighted to see the emergence of Molinari on the global stage over the past few seasons but it hasn’t always been an easy ride for the Italian. There have been moments in his career when he hasn’t been the best golfer in his family, let alone in a European Ryder Cup team. Oddly for a man who has just become the first Italian to win the Open Championship, Francesco’s first major championship appearance came as a caddy for his brother in the 2006 US Masters Championship. Brother, Eduardo Molinari, who is two years Francesco’s senior, had become the first European to win the prized US Amateur Championship in 2005 and as a result booked his place to Augusta the following season. The two brothers originally hail from Turin where they found their love for the game playing golf with their parents and grandparents at Circolo Golf Turin. The duo remained close throughout their rise through the professional ranks and became the first brothers to play together on the same team in a Ryder Cup for 47 years at Celtic Manor in 2010. Early on in his career it was thought that Eduardo was the more gifted, natural player while Francesco was more of a plodder on the course. Although this opinion may have had an element of truth to it, Francesco was hampered by perennial issues with his putting. To have such a consistent golf swing but an inability to convert his chances was such a source of frustration that Francesco didn’t know how he would be able to fulfil his potential. However, the Italian has recently turned to putting guru Phil Kenyon and has credited the Englishman with a turnaround in his fortunes. Kenyon has coached the likes of Justin Rose, Henrik Stenson and Rory McIlroy amongst others, so Molinari is certainly in good company. Francesco also credits recent work with British performance coach Dave Alfred, who has also worked with Luke Donald and Padraig Harrington, for his successful 2018. One other coach who has had a major impact on the impeccably grooved Molinari swing is Denis Pugh. The Englishman, who until recently worked as a pundit on Sky Sports, is the Italian’s long-time coach and said that after a disappointing finish in May’s Players Championship, Molinari’s game clicked. The week after the Players Championship, Molinari held off Rory McIlroy to win the European Tour’s top event at Wentworth before decimating a field including Tiger Woods at the Quicken Loans Championship in the United States in June. Off the back of these results, it wasn’t a surprise that Molinari challenged at Carnoustie but to become the first Italian in history to win the Open is a truly remarkable achievement. Molinari’s rise in 2018 augurs well for the future of Italian golf, especially with the Italian at the forefront of the marketing campaign for the 2022 Ryder Cup which will be held at the Marco Simone Country Club outside Rome. The fact that the BBC Sports Personality of the Year awards have given Francesco “more motivation for next season” should be a warning sign to his rivals. Molinari is just getting started.